This introductory chapter, written by the editors of this book, provides a personal account of the origins of this unique teaching and learning resource. Part of its motivation lies in the paradox that economic historians are perceived to be an endangered species at the exact moment there is newfound demand for their services. 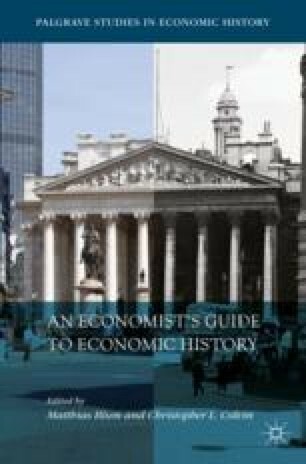 The other is the active economic history scene that is populated by researchers with diverse academic backgrounds, exemplified by the contributors to this book. We thank Michael Aldous, Graham Brownlow and John Turner for comments on this chapter in particular, and for supporting us more generally throughout this project. Without their input very early on, we would not have been able to get this book off the ground. We thank our publishers, Clara Heathcock and Laura Pacey, for giving us the freedom to make something a little different. Finally, we thank Adi McCrea for the data visualisations throughout the book, and Vinodh Kumar and his team for copyediting and typesetting the text. ———. 2018. In Defence of the Economists. Prospect, April 13. https://www.prospectmagazine.co.uk/economics-and-finance/dianecoyle. Elliott, Larry. 2017. Heretics Welcome! Economics Needs a New Reformation. The Guardian, December 17. https://www.theguardian.com/business/2017/dec/17/heretics-welcome-economics-needs-a-new-reformation. Giles, Chris. 2018. Has Economics Failed? No—As Long as You Do Not Expect Soothsaying, It is Remarkably Successful. The Financial Times, April 24. https://www.ft.com/content/670607fc-43c5-11e8-97ce-ea0c2bf34a0b. O’Rourke, Kevin. 2013. Why Economics Needs Economic History. VoxEU.org, July 24. CEPR Policy Portal. https://voxeu.org/article/why-economicsneeds-economic-history.